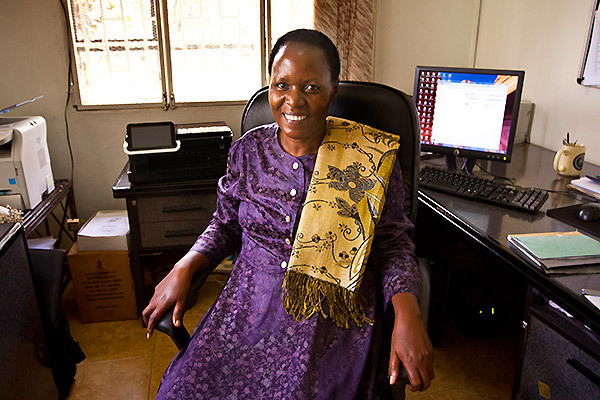 Peace Habomugisha has an office in Kampala, Uganda, but it's usually empty. As the Carter Center's representative in Uganda, Habomugisha typically can be found out in the field, keeping the river blindness program on track. She makes sure health workers are distributing medication in the right doses at the right times and health education is being delivered effectively. Uganda is one of four endemic countries in Africa where The Carter Center currently works to eliminate river blindness, a parasitic infection spread by the bites of small black flies that can cause severe itching and scarring, eye damage, and irreversible blindness, reducing an individual's ability to work and learn. Habomugisha has a tough job, made tougher because she's a woman in the male-dominated culture of East Africa. She said in the rural districts she visits, people sometimes question her authority. "But then I talk to them and explain how to improve their community's health, and I have never been rejected anywhere," she said. In recent years, Habomugisha was key in taking Uganda from a country that controlled the spread of river blindness to helping the government launch an ambitious plan to eliminate the disease. Today, transmission of river blindness has been interrupted in 15 of the original 17 foci, meaning some 2.7 million Ugandans are no longer at risk for this debilitating disease. 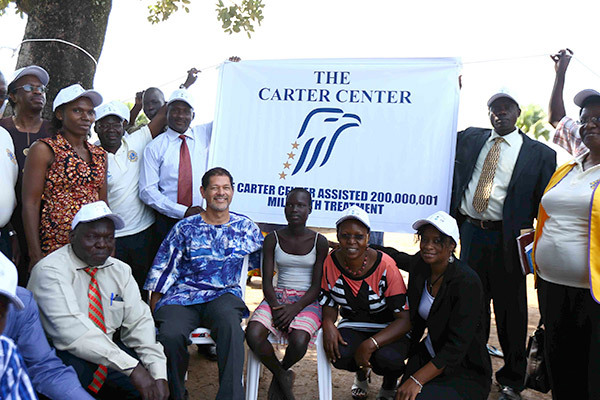 To celebrate the country's great progress, The Carter Center chose Uganda to help commemorate a recent milestone: the distribution of the Center's worldwide 200 millionth treatment of Mectizan®, the drug used to halt river blindness, (donated by Merck). More specifically, the district in Uganda selected for the celebration was Lamwo, chosen because of its remarkable increase in the number of people covered by treatment - from 36 percent a year ago to over 90 percent today. Success in Uganda will offer hope for other countries struggling with this affliction. "When we began this elimination program, I attended a meeting where people said it wasn't possible to eliminate river blindness in Africa," said Habomugisha. "But Uganda is proving them wrong."